You get ambiences capturing sounds ranging from characterful narrow side streets to busy high streets, lively squares, vivid pedestrian areas, clouds of walla, small and big construction sides and ideal diffuse top roof atmospheres. With this ambience surround library you get the sound of Istanbul, captured with our discrete wide spaced omni rig which has proven to be perfect for cinematic needs. You get over 27 GB of 5.0 ambiences capturing sounds ranging from characterful narrow side streets to busy high streets, lively squares, vivid pedestrian areas, clouds of walla, small and big construction sides and ideal diffuse top roof atmospheres. We recorded on the Asian and European side of Istanbul, indoors and outdoors - during all day times. 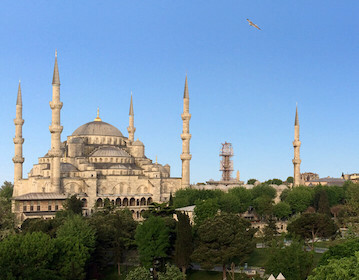 We covered historic places from the Cistern Basilica, the Grand Bazaar or the Blue Mosque. We have been there to capture as much of this breath taking city as possible. Istanbul is vibrant, fascinating and huge! It is actually the largest european city and the gate to the Asian continent. You will be served with empty mosques, spacious bazaar bustle, diffuse call to prayers, lively small streets, playing children, dense walla, ringing tram bells, heavy traffic, screaming seagulls and much more. The sheer size of Istanbul becomes more apparent when recording from a top roof and we got plenty of those! For producing the city ambience library of Istanbul we have made a lot of research and together with the crucial help from the local director Sinem Sakaoglu, we managed to get to places, that would not have been accessible without her. For example recording in the Basilica Cistern or the Blue Mosque without any people or tourists was quiet an experience. We were equipped with our wide spaced omni rig (The Williams Tree), with 5 Sennheiser Mkh 8020 microphones and an extra Double MS Setup with a Mkh8040,8050 and Mkh30 for situations where we had to be most flexible. We can´t praise our wide spaced Omni Rig enough, we did several tests in the past, and we can say with certainty that true wide spaced time of arrival recorded ambiences are best suited for cinematic needs. But also on studio or TV speakers this wideness just pleases the listener. A lot of the ambiences can be used for other cities places as well. We can imagine a lot of projects and scenarios where this library has to offer a lot in terms for designing urban ambiences. Enjoy diving into one of one of the most interesting cities on Earth - Istanbul.